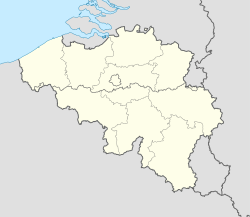 Chastre (Walloon: Tchåsse) is a municipality located in the Belgian province of Walloon Brabant. On January 1, 2006, Chastre had a total population of 6,734. The total area is 31.27 km² which gives a population density of 215 inhabitants per km². The villages in the municipality are Chastre, Villeroux, Blanmont, Cortil, Noirmont, Gentinnes, and Saint-Géry. The CHASTRE-VILLEROUX post-office opened on 10 May 1876, GENTINNES on 28 April 1905, BLANMONT on 27 November 1908. Postal code 1450 since at least October 1990. Postal codes in 1969 (before the merger of municipalities in 1977): - 5860 Chastre-Villeroux-Blanmont - 5861 Cortil-Noirmont - 5862 Gentinnes - 5863 Saint-Géry. ^ "Official site of the municipality of Chastre". ^ Les numéros postaux belges en vigueur à partir du 1/10/1990, La Poste. This Walloon Brabant location article is a stub. You can help Wikipedia by expanding it. This page was last edited on 13 January 2017, at 06:36 (UTC).